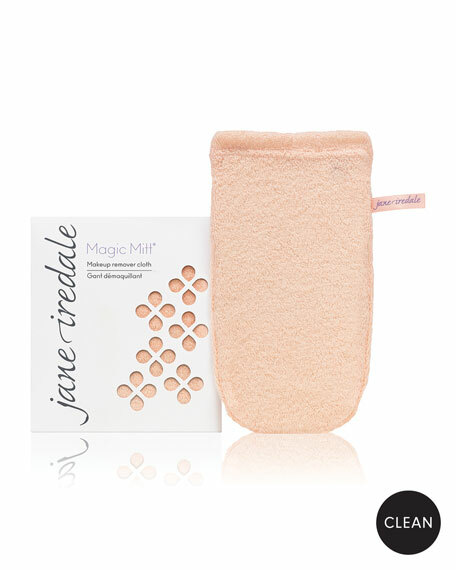 A knitted microfiber cleansing cloth that quickly and completely removes makeup using water only. Promotes the health of the skin because it does not affect the acid mantle. When this beneficial barrier is intact, it aids the skin in protecting itself from harmful and invasive bacteria. Made from a new generation of specially knitted micro-fibers many times thinner than a human hair and which are able to penetrate oil films. This hydro-mechanical process breaks the surface tension of the oils that bond makeup to the skin while the fibers gently exfoliate. The combination of warm water and micro-fibers turn the makeup into an emulsion that is easily swept away by the mitt. It will even remove mascara! Wet with warm water and place over hand. Use gentle circular motions to remove all face and eye makeup.